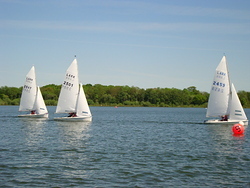 Barnt Green Sailing Club runs a number of race series during the year. Morning races for sailboards only - Two races of around 30 minutes for 7.5m 2 Raceboards. In addition, there will be an 'Allcomers' race category. Warning signal for the first race is at 11:00hrs. The warning signal for the second race will be as soon as possible after the preceding race. Morning race for sailboards and dinghies - One race of around 45 minutes for all boats and boards on an Average Lap basis. Warning signal is at 12:30hrs. Afternoon races for dingies only - Two races of around 45 minutes for all boats on an Average Lap basis. Warning signal is at 14:15hrs. Morning races for sailboards only - Two races of around 30 minutes for 7.5m 2 Raceboards. In addition there will be an 'Allcomers' race category. Warning signal for the first race is at 11:00hrs. The warning signal for the second race will be as soon as possible after the preceding race. Early and Late Wednesday Series between April and June, and June to September on a pursuit basis for dinghies, with senior and junior class divisions. Sailboards have a separate race. Both pursuit races finish at 20.00. The actual start times are staggered, and within the range of 18.45.35 (Mirrors) to 19.02.58 (single handed Larks). Start times for the Club's adopted classes are to be found in 'Guidance for Race Officer Teams', Section 9b. The Frostbite series of races will be on Sundays between October and December. There will be 2 races of around 45 minutes each on an Average Lap basis. Warning signal for the first race is at 11:00hrs. The latest results for each series can be viewed by clicking on the links on the right side of this page.